Submitted by Migrate Wizard on 2014-07-01 09:08. This hak add several new armour and clothing parts of an oriental theme. The parts are only useable by human male and female(thin phenotype only). 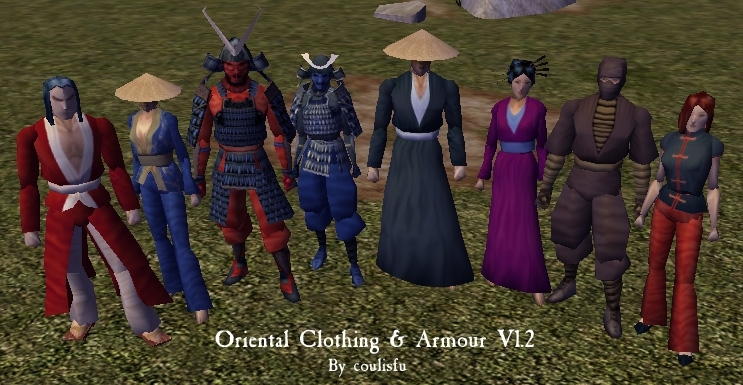 The parts included should be able to make four basic outfits, kungfu, samurai, ninja and kimono/splitcoat. I've also included some helms to make samurai kabuto, ninja cowls and a conical peasant hat. There is an erf with some examples of what you can make. I've also included a link to an online reference sheet in the zip. Big thanks to lisa for the skinmesh kimono model included in this hak, which I retextured with plain cloth. Cheers Lisa! Minor Update to v1.2 - New Content, proper kimono robe skinmesh models(again thanks Lisa) and a new torso to match. new Armour Class for the ninja torso(AC2) and samurai torso(AC4). Changed the colour channel for the sandel feet so they can be coloured differently to most outfits. Using this in Dark Energy. Thanks!